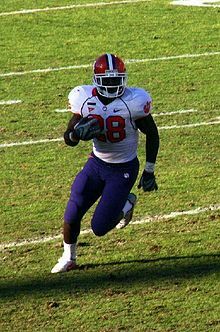 C. J. Spiller was the only unanimous 2009 All-American who was selected at multiple positions. The College Football All-America Team is an honor given annually to the best American college football players at their respective positions. The original All-America team was the 1889 College Football All-America Team selected by Caspar Whitney and Walter Camp. In 1950, the National Collegiate Athletic Bureau, which is the National Collegiate Athletic Association's (NCAA) service bureau, compiled the first list of All-Americans including first-team selections on teams created for a national audience that received national circulation with the intent of recognizing selections made from viewpoints that were nationwide. Since 1952, College Sports Information Directors of America (CoSIDA) has bestowed Academic All-American recognition on male and female athletes in Divisions I, II, and III of the NCAA as well as National Association of Intercollegiate Athletics athletes, covering all NCAA championship sports. The 2009 College Football All-America Team is composed of the following College Football All-American first teams: Associated Press (AP), Football Writers Association of America (FWAA), American Football Coaches Association (AFCA), Walter Camp Football Foundation (WCFF), The Sporting News (TSN), Sports Illustrated (SI), Pro Football Weekly (PFW), ESPN, CBS Sports (CBS), College Football News (CFN), Rivals.com, and Scout.com. Academic All-American Zoltan Mesko was the first kicking specialist chosen in the 2010 NFL Draft. For the 2009 NCAA Division I FBS football season, the following players were unanimous first-team selections on the twelve nationwide lists exhibited below: Eric Berry, Drew Butler, Joe Haden, Russell Okung, C. J. Spiller, Ndamukong Suh and Golden Tate. Of the unanimous selections, Spiller was the only player selected at multiple positions: running back by Pro Football Weekly and Kickoff returner by all other selection committees. In addition, Toby Gerhart, Jerry Hughes, Mark Ingram Jr., Rolando McClain and Colt McCoy were unanimous first-team selections by the five NCAA-sanctioned selectors. Mike Johnson, Mike Iupati and Earl Thomas were selected to the most (10 each) first team lists without being unanimously selected by all five of the NCAA-sanctioned first team lists. Danario Alexander was selected to the four lists without being chosen to any of the NCAA-sanctioned first team lists, while Kellen Moore and Brandon Graham were each selected to three unsanctioned first team lists. Colt McCoy has the distinction of being selected to the least number of lists (8) while being selected to all five sanctioned first teams. Zane Beadles, who was a 2009 second team Academic All-America selection, is the only player to make one of the 2009 College Football All-America Teams and the 2009 College Football Academic All-America Team. Tim Tebow, who was a 2007 and 2008 College Football All-America Team selection, was a first team 2009 College Football Academic All-America Team selection. The following players were selected to the University Division Academic All-America first and second teams. ^ The Michigan alumnus. University of Michigan Library. 2010. p. 495. ASIN B0037HO8MY. ^ Martin, John Stuart (October 1961). "Walter Camp and His Gridiron Game". American Heritage. 12 (6). Archived from the original on 2008-07-23. Retrieved 2010-05-21. ^ "Football Award Winners". NCAA. Archived from the original on 2009-07-14. Retrieved 2010-05-21. ^ "Florida's Tim Tebow and Morningside's Beau Kildow top ESPN the Magazine's Academic All-America Football Team". College Sports Information Directors of America. 2009-11-24. Archived from the original on 2017-11-18. Retrieved 2010-02-12. ^ "2009–10 NCAA Statistics Policies (updated 9/2/2009)". National Collegiate Athletic Association. Archived from the original on 2010-05-21. Retrieved 2010-05-21. ^ a b "Tebow, Kildow top Academic team". ESPN. 2009-11-24. Retrieved 2010-05-21. ^ a b "2009 Academic All-America Football Team" (PDF). College Sports Information Directors of America. Retrieved 2010-06-27. ^ "Ingram, McClain lead 6 Alabama AP All-Americans". SportingNews.com. 2009-12-15. Archived from the original on 2009-12-18. Retrieved 2010-06-07. ^ "FWAA Names 2009 All-America Team". Football Writers Association of America. 2009-12-12. Retrieved 2010-06-07. ^ "2009 AFCA FBS Coaches' All-America Team". American Football Coaches Association. 2009-12-03. Archived from the original on 2009-12-06. Retrieved 2010-06-07. ^ "2009 Walter Camp All-America Team Announced". Walter Camp Football Foundation. 2009-12-10. Archived from the original on 2009-12-14. Retrieved 2010-06-07. ^ "2009 Sporting News college football All-America first team". SportingNews.com. 2009-12-15. Archived from the original on 2009-12-16. Retrieved 2010-06-07. ^ "SI.com's 2009 All-Americas". Sports Illustrated. Time Inc. 2009-12-15. Retrieved 2010-06-07. ^ "All-America team". Pro Football Weekly, LLC. 2009-12-22. Archived from the original on 2009-12-25. Retrieved 2010-06-07. ^ "Ingram, Gerhart lead All-Americans". ESPN Internet Ventures. 2010-01-14. Retrieved 2010-06-07. ^ "CBSSports.com 2009 All-America Team". CBS Interactive. Archived from the original on 2012-10-11. Retrieved 2010-06-07. ^ "2009 CFN All-America Teams". CollegeFootballNews.com and Scout.com. 2009-12-16. Archived from the original on 2009-12-19. Retrieved 2010-06-07. ^ "Rivals.com 2009 All-America Teams". Rivals.com. 2009-12-15. Archived from the original on 2010-01-03. Retrieved 2010-06-07. ^ Safrit, Miller (2009-12-15). "Scout.com All-America Team". Scout.com. Retrieved 2010-06-07. ^ "Colt McCoy: 2009 The Maxwell Award winner". Maxwell Football Club. Archived from the original on 23 July 2010. Retrieved 2010-06-19. ^ "Chic Harley Award Recipients". touchdownclubofcolumbus.com. Archived from the original on 2007-10-16. Retrieved 2010-06-19. ^ "Texas Quarterback Colt McCoy Repeats as Walter Camp Player of the Year". Walter Camp Football Foundation. Archived from the original on 2011-07-28. Retrieved 2010-06-19. ^ "Colt McCoy: Overview". CBS Sports. Retrieved 2010-06-19. ^ a b "Archie Griffin Award Recipients". touchdownclubofcolumbus.com. Archived from the original on 2007-10-16. Retrieved 2010-06-19. ^ "Recovering McCoy gets O'Brien Award". ESPN. Retrieved 2010-06-19. ^ "Texas QB Colt McCoy Wins 2009 Johnny Unitas Golden Arm Award" (PDF). Golden Arm Foundation. 2009-12-03. Retrieved 2010-06-19. ^ "Manning Award". Allstate Sugar Bowl. Retrieved 2010-06-19. ^ "Sammy Baugh Award Recipients". touchdownclubofcolumbus.com. Archived from the original on 2007-10-16. Retrieved 2010-06-19. ^ "Official Toby Gerhart NFL bio". Scout.com. Retrieved 2010-06-19. ^ "Heisman Winners". HeismanTrophy.com. Archived from the original on 2014-08-01. Retrieved 2010-06-19. ^ "Sporting News 2009 college football Player of the Year: Mark Ingram, Alabama tailback". SportingNews.com. Archived from the original on 2010-02-25. Retrieved 2010-06-19. ^ "Golden Tate Wins Biletnikoff Award, Named Walter Camp First Team All-American: Junior is the first Irish wideout to capture the Biletnikoff award". CBS Interactive. 2009-12-10. Retrieved 2010-06-19. ^ "Sons of Wildcats make bowl game headlines". ACU Today Magazine. 2010-01-07. Retrieved 2010-06-19. ^ "2009 John Mackey Award Recipient: Aaron Hernandez of Florida". johnmackeyaward.org. 2009-12-10. Archived from the original on 6 May 2010. Retrieved 2010-06-19. ^ "Rimington Trophy: Past Winners". rimingtontrophy.com. Archived from the original on 28 May 2010. Retrieved 2010-06-19. ^ "Hughes Named Winner Of Lott Trophy". lotttrophy.com. Archived from the original on July 18, 2010. Retrieved 2010-06-19. ^ Caplan, Jeff (2009-12-09). "TCU's Hughes wins Hendricks award". ESPN. Retrieved 2010-06-18. ^ a b c d e f "#93 Ndamukong Suh". Nebraska Huskers. Retrieved 2010-06-19. ^ "The Butkus Award: Past Winners". The Butkus Award. Retrieved 2010-06-19. ^ "Alabama football: Rolando McClain wins Lambert Award; Terrence Cody misses out on Nagurski Award". Ledger-Enquirer.com. Retrieved 2010-06-19. ^ "Past Honorees". Touchdown Club of Columbus. Archived from the original on 2012-12-05. Retrieved 2010-06-19. ^ "Eric Berry, FS". CBS Sports. Retrieved 2010-06-20. ^ "Lou Groza Collegiate Place-Kicker Award". Palm Beach County Sports Commission. Archived from the original on 14 May 2010. Retrieved 2010-06-19. ^ "Ray Guy Award". Augusta Sports Council. Archived from the original on 10 July 2010. Retrieved 2010-06-19.